We are blowing out the cartographic pipe here with three awesome new Maps to Conquer. They are each very different and will require some keen strategy to master. I’ll Shepherd, our Carto-General gives you the run down. Shepherd: For starters, RjBeals has created Conflict: Africa. 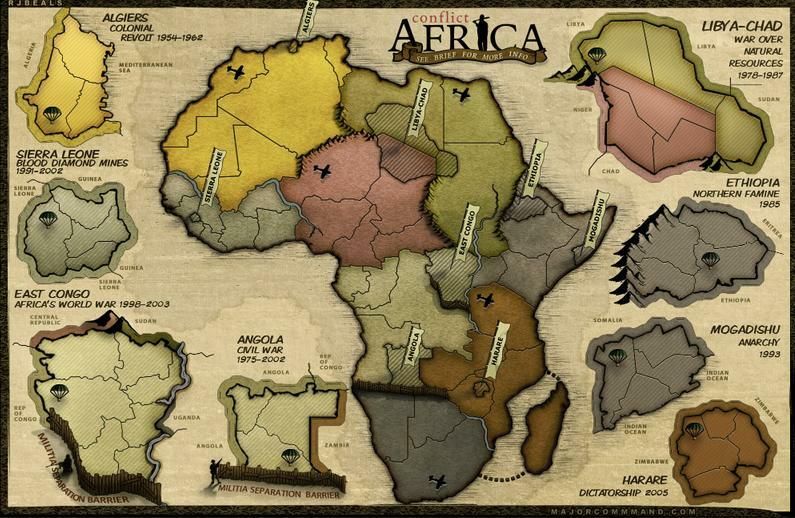 It’s a continent map, but with a unique twist and a nod to recent history; the map features eight Conflict Zones that reflect civil wars and strife over the past four decades. Entering the regions of conflict comes with a price, and you need to weigh the risks and rewards in your quest to unite and bring peace to Africa. 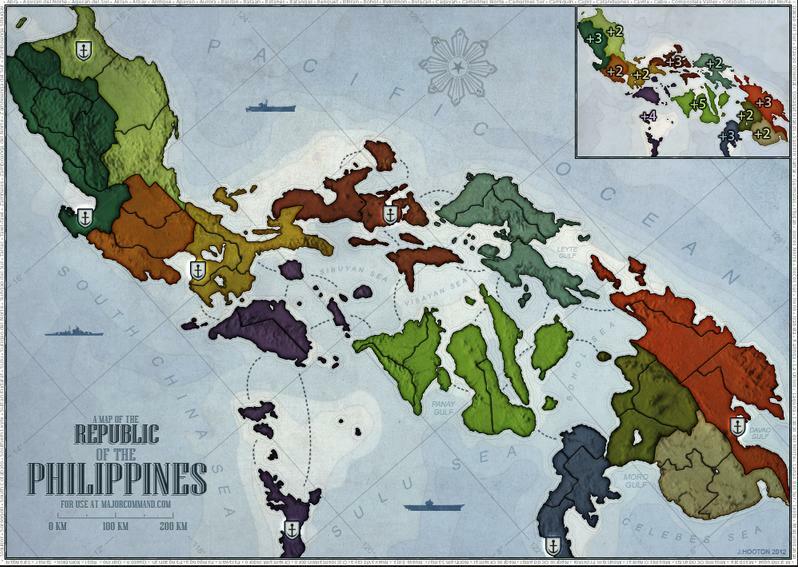 This month we also introduce the first map developed in our Map Studios, The Philippines. 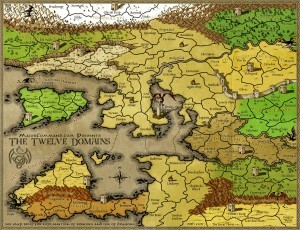 KungFuDuet launched the idea for this map back in January and saw the process through rigorous discussion and debate. Once we were satisfied that the map idea was worthy of play, Widowmakers stepped in and turned it into a fine piece of art. Winning on this map will require controlling both land and sea, as you hop from island to island while keeping a watchful eye on the navies lurking off shore. Finally, this month we offer up our first of what we hope will be many Bonus Maps, available exclusively to Strategist and Commander class users. 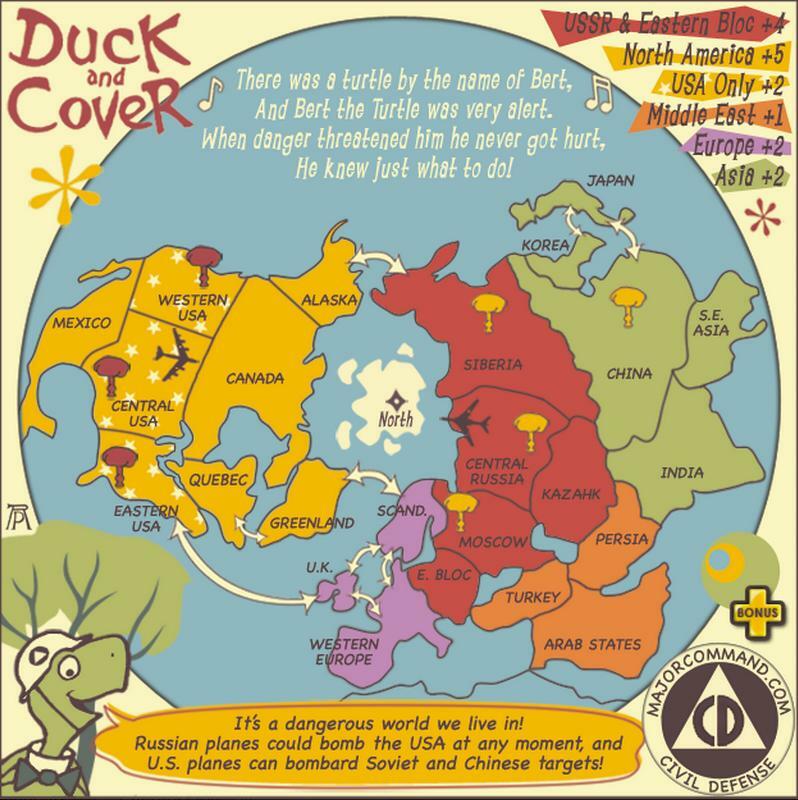 Duck and Cover may look familiar to some, as it recalls an era when an atomic blast was something that could be survived by watching a short instructional film about hiding under a desk. It’s a small map for a time when it was a small world after all, and superpowers were poised to lob bombs at each other from afar. If you want to hop right into a game on these maps, click here. Or start one yourself with your own settings. Remember to read that brief tab! Good luck out there! 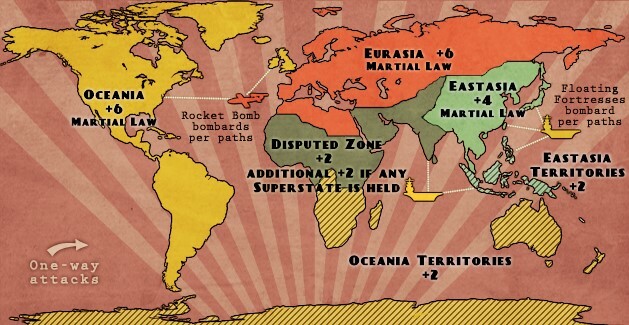 When we launched the Major Command Risk game nuke map a few months ago, it quickly became one of the most popular maps on the site, to the tune of over five hundred games played since its debut. However, after feedback from users, we’ve come to realize that the map lends itself a bit too well toward stalemate in two-player games. Specifically, the Spy regions are a bit overpowered, which can drag games out preposterously as the chances for the Spy to take out either the President/Premier or Target regions, thus preventing a nuclear launch, grew to well north of 90%. 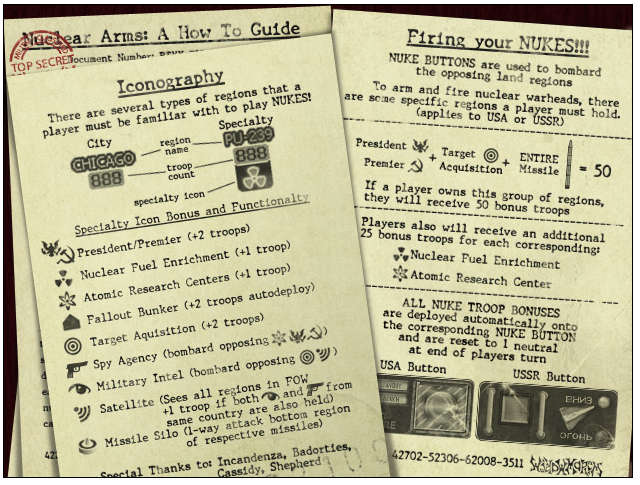 See www.majorcommand.com/wiki/Nukes. The creators of the map have spent some time discussing potential fixes, and we think we have the overpowered Spy problem sorted out. Thus, we are rolling out a slightly altered version of the map which will replace the current map. Each country, instead of having two Spy regions, now has one Spy Agency region and one Military Intel region. Military Intel regions, represented by the EYE symbol, can bombard opposing “tech/equipment”, Targets and Satellites. By splitting up the power of the Spy regions, the map now requires players to properly counter their opponent’s moves on the other side of the map, rather than just parking a giant stack in one Spy region and dragging the game into the stalemate. Also, once the Fog of War setting is implemented, players will be able to bombard their opponent’s Satellite, rendering their opponent blind. This change will go into effect on 3/24, giving people ample time to prepare for the changeover. 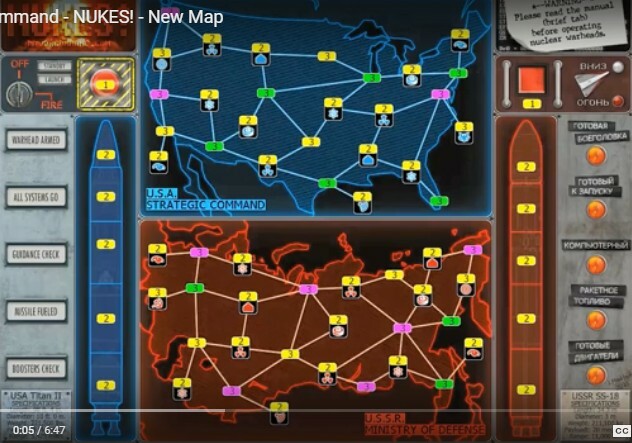 This should have a minimal effect on active games, and by simply altering the existing map we are preserving everyone’s Unique Defeated Opponents. We firmly believe that this small changes will virtually eliminate the stalemate issue in two-player games. As always, we welcome feedback from everyone on Major Command Risk. We understand if people preferred the old version of the map, but rest assured we’re only making this change after around two months of discussion, both privately and publicly. Badorties and the MC Cartoteam. 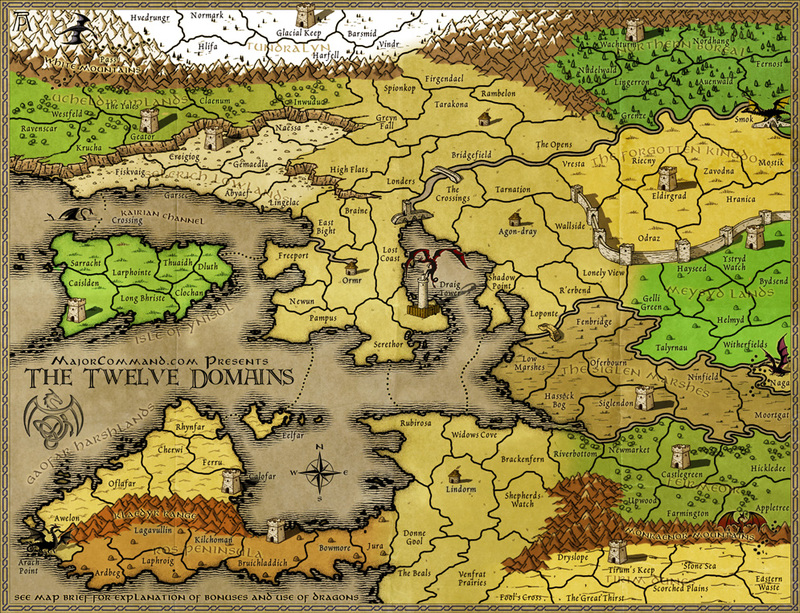 The new twelve domains map has arrived. We at Major Command are starting off 2012 in style with our gorgeous new map designed and executed by our Studio chief himself, Shepherd. Now the twelve domains map is quite different than other maps so you should understand how it works before you jump right in. In this video, Shepherd fills you in on the mechanics and how to use those dreadful dragons. There is more info on its wiki page and also a thread in the forums. So let us know your thoughts on our first conquest map. Enjoy!